SUPPLIES NEEDED: 12''x12'' inch drawing paper, ruler, pencil, tracing paper, compass, protractor, mirror and tempera paint. ____/125pts Creativity / Originality: Did you explore several color schemes before selecting one; generating many ideas; tried unusual combinations or changes on several ideas? 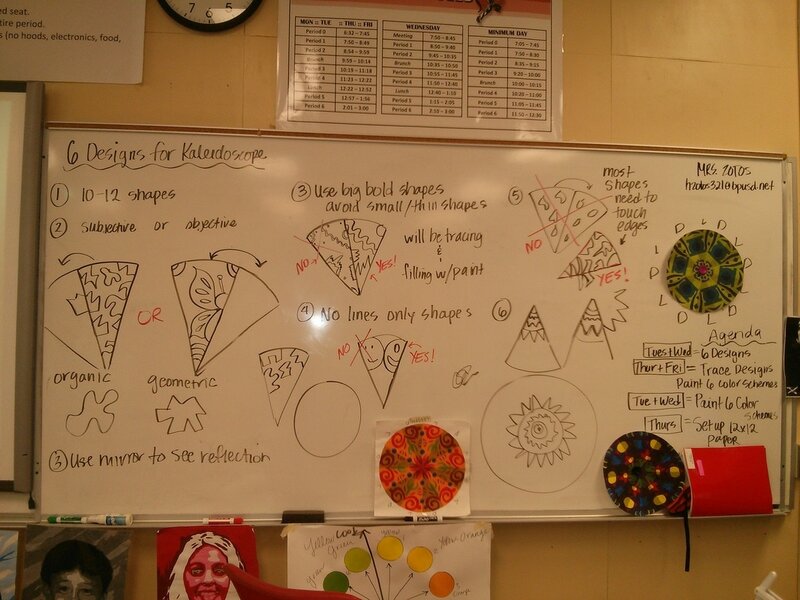 STEP #1 - DESIGNS FOR KALEIDOSCOPE. 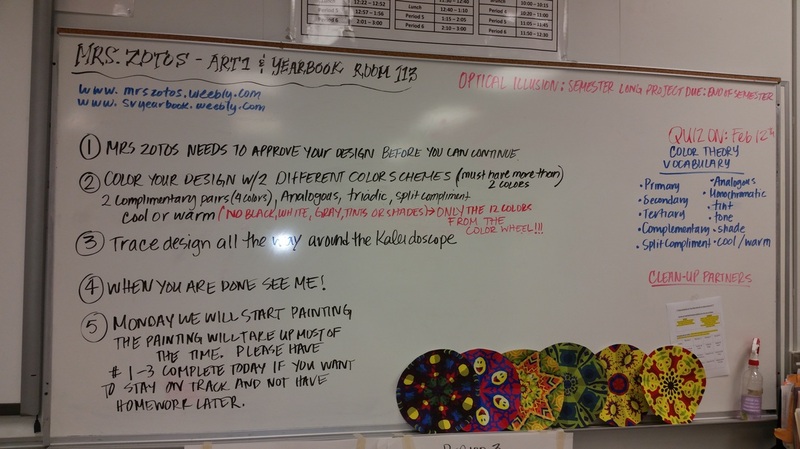 Come up with 5 possible designs for your kaleidoscope on the sheet below. 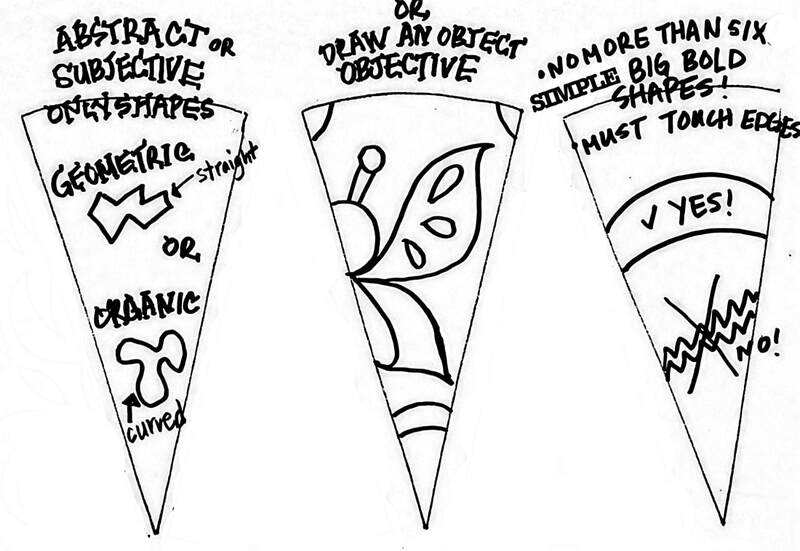 Your design can be subjective (just shapes) or objective (draw an object). Draw no more than six simple big bold shapes that will be easy to fill with color. Shapes must touch the edges. 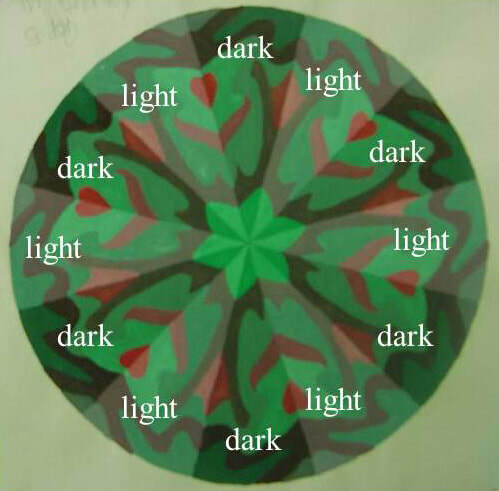 You will be tracing your design all the way around your kaleidoscope later. It is important that you check your designs reflection with a mirror. Is the reflection creating an interesting new design? STEP #2 - PICK A COLOR SCHEME. 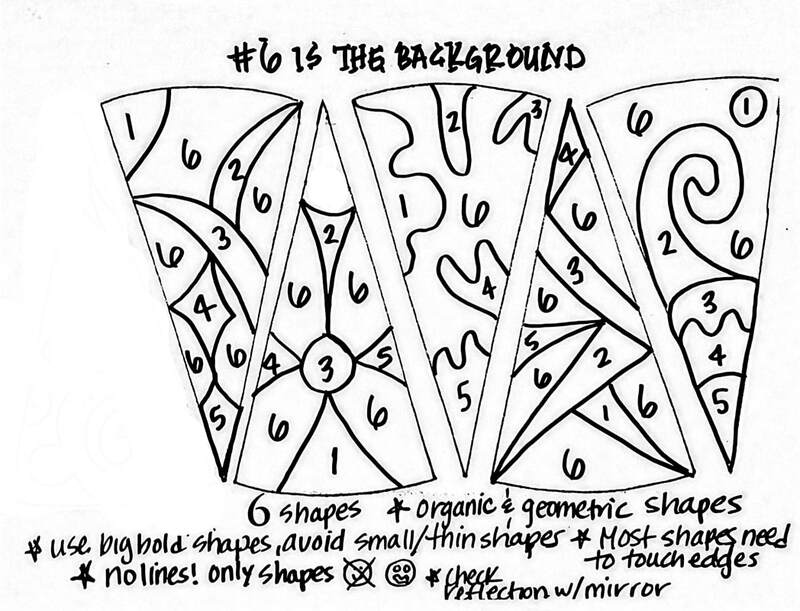 Pick your most interesting design and trace it onto the back of your sheet 3 times. Try 3 different color schemes with colored pencils. 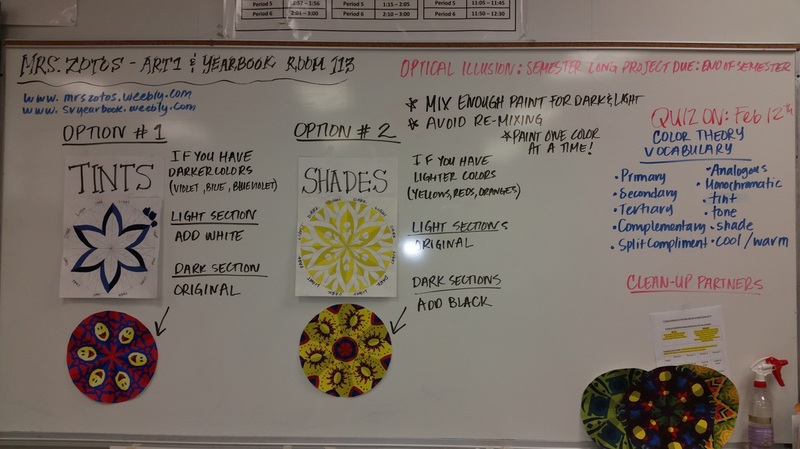 Try the color schemes we learned about. Here are some combinations: ALL COOL , ALL WARM, BACKGROUND WARM/SHAPES COOL, BACKGROUND COOL/ SHAPES WARM, ANALOGOUS (3-4 colors in a row on the wheel) , 2-3 PAIRS of COMPLEMENTARY COLORS (orange/blue, red/green, violet/yellow), SPLIT COMPLIMENT, TRIADIC (primaries or secondaries). STEP #3 - SET UP YOUR PAPER FOR THE KALEIDOSCOPE. 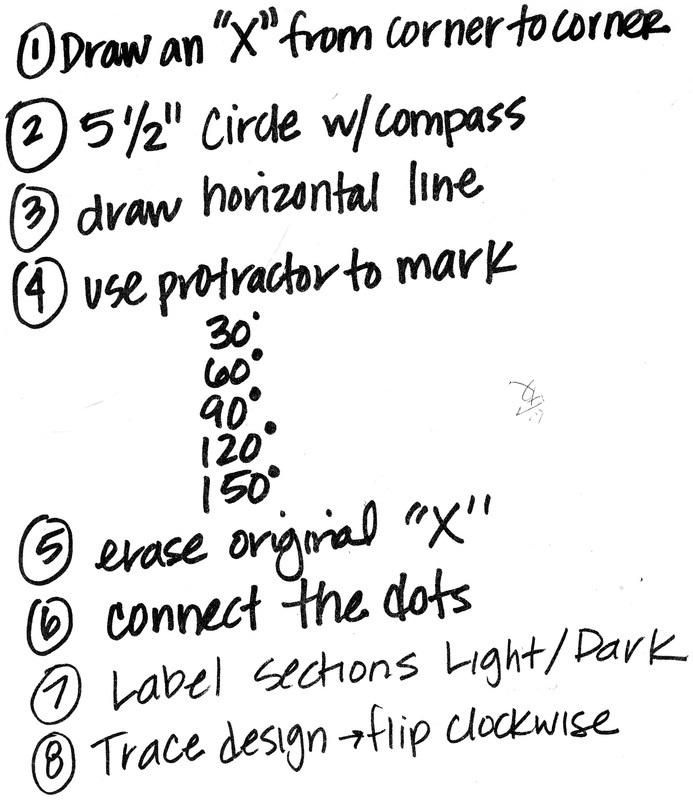 You will need 12''x12'' drawing paper, a pencil, an eraser, a ruler, a compass, a protractor and tracing paper. Watch video below for steps. Put your ear buds on. STEP #4 - COLOR YOUR KALEIDOSCOPE & CREATE THE 3D EFFECT. 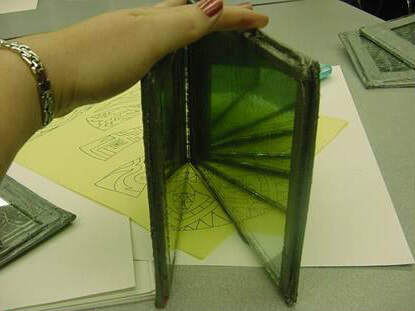 Notice how this kaleidoscope looks like it has been folded like a fan. It appears to have peaks and valleys. If the value difference is too great or too small you will not achieve the 3d effect. If you have darker background colors you will paint the original paint color in the dark sections and the tints (add white to color) to the light sections. If you have lighter background colors your original paint colors will go in the light sections and the shades (add black to color) will go in the dark sections. See image below.